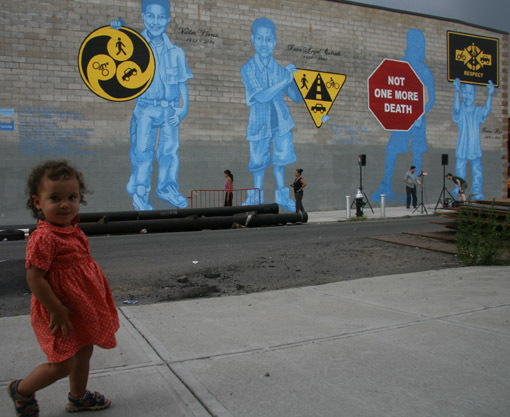 Groundswell Community Mural Project and Transportation Alternatives unveiled a mural yesterday evening at Third Avenue and Butler Street in Brooklyn’s Gowanus neighborhood. Conceived by local youth and facilitated by artists Christopher Cardinale and Nicole Schulman, the ghostly, three-story tall painting pays tribute to three young boys; Victor Flores, Juan Estrada, James Rice, and the 28 pedestrians killed by cars on Third and Fourth Avenues between 1995 and 2007. It was a pretty powerful and emotional event. We’ve got more photos and coverage on the way. The mural looks beautiful! I’m happy to see photos of it. Props to all the artists (community artists, painter artists, activist artists, etc.) for making it happen. Looking forward to more coverage! That mural looks great! Much bigger than I realized it would be. The mural is very moving. The artists and community did a great job. Went to check this out this afternoon. Very awesome, but there was a glass truck (truck of a glass company, not a truck made out of glass) who parked in the bike lane right in front of me just as I rolled up!